Israel’s cabinet ha approved Tourism Minister Yariv Levin proposal to invest NIS 200 million in the construction of the tourist cable car project to Jerusalem’s Old City. 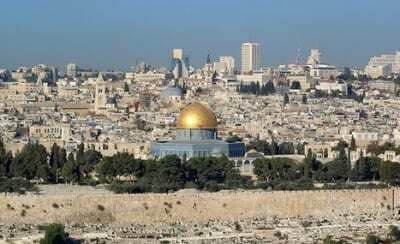 Last year, on Jerusalem Day 2017 during the 50th anniversary of the city’s reunification, the government approved the first phase of the project with a budget of NIS 15 million from the Ministry of Tourism. Today, the government approved the additional investment from the 2018-20 budget.. The Ministry of Tourism operates in a variety of ways in order to improve the tourism product in Israel and to strengthen tourism as an engine for economic growth. 2017 ended with an all-time record for incoming tourists with more than 3.6 million tourists. The upward trend continues in 2018. Jerusalem is one of the central tourism anchors in Israel, and as such, the Ministry of Tourism focuses its efforts on infrastructure, marketing and tourism product development in Jerusalem. The cable car can be another factor in encouraging tourism to Jerusalem, while offering a transportation solution for visitors and tourists who visit the city. The cable car is defined as a project of great importance for Jerusalem and for its tourism industry, as well one which offers provides transportation and environmental solutions, and makes the Old City accessible for people with disabilities. On days that mark holidays for the three religions, visitors to the Old City can range from tens of thousands to hundreds of thousands of people. Today, most vehicular traffic is banned within the Old City, with the exception of residents, but government officials claim that a significant solution is needed for access from the walls into the Old City. The planned cable car route is 1,400 meters long, and will run between the First Station compound in the German Colony, through the Mount of Olives to the Dung Gate at the Old City walls. The cable car has four stations, including Mount Zion and the Kedem Visitor Center in the City of David. Most of the planned route will pass through publicly owned land.